There is absolutely no way of telling if this story is true, but a poster on the mobileburn forum was sent a survey to complete through equip-surveys.com about a "Google Phone". The poster recalls seeing the specs, but says he forgot to take a screenshot of them. The picture, which is probably photoshopped (even if it's a real product), looks pretty good — nothing too crazy though. It has a concealed qwerty keyboard under the display, and a couple standard buttons that look a bit like Google Talk icons. The screen appears to switch between portrait and landscape view like the iPhone — probably using an accelerometer. 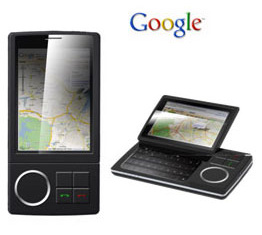 The Google Phone brings the power of the internet in your pocket, in a simple and intuitive device. It combines the traditional voice and SMS capabilities of phones with all the exciting Google services from the PC such as Search, Gmail, Maps, Blogger. The Google Phone, designed by Samsung, is a very thing and stylish handset with a large screen and a QWERTY keypad so that it provides a real internet experience. All these internet services will be available under a simple Internet monthly flat fee, comparable to PC Broadband products, giving you transparency and control over your mobile bill. Thanks to simple, relevant advertising, Google will even give you a 3 month discount on your mobile Internet monthly flat fee. I wonder who will be the next big internet Giants in China going after the mobile devices market. Sina Phone? Sohu Phone?? Baidu Phone?? ?